← Arrived: First of Our Long Awaited Refugee Families! Prepare for Rosh Hashanah in a new way this year. Rabbi Hannah and guest jazz saxophonist Rabbi Neil Blumofe will meld Chassidic melody with jazz, accompanied by a fine band of local musicians. 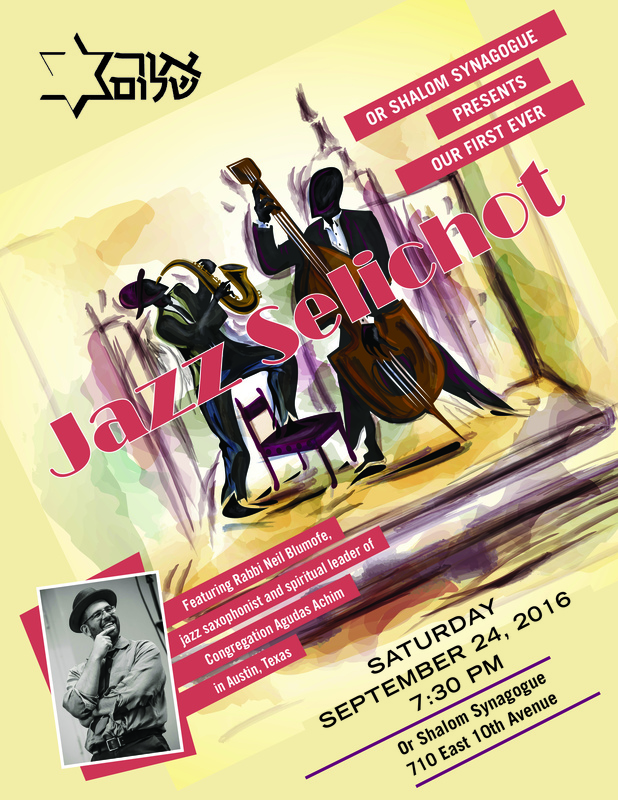 Mark this date for Or Shalom’s first Jazz Selichot – you won’t find anything like this! This entry was posted in Upcoming Events and tagged Jazz, Music, Rosh Hashanah, Selichot. Bookmark the permalink. Hi. I did not see a price for this event; – jazz, on 9-24….if i could make a reservation, i’d love to have 3 tickets (provided…the price is not sky-high…) Thx. There is no charge for this event Kati, but seating is limited. Thank you for letting me know! I’ll try to make it early…i’m bringing a 96 years young lady…Shalom.